 The staff in the Behavioral Health unit at UPMC Northwest have spent years caring for some of the community’s most vulnerable individuals, those who have experienced severe trauma, various types of abuse, addiction, loss, illness and financial strain.  Their goal is to look at the whole patient while treating both physical and emotional symptoms. 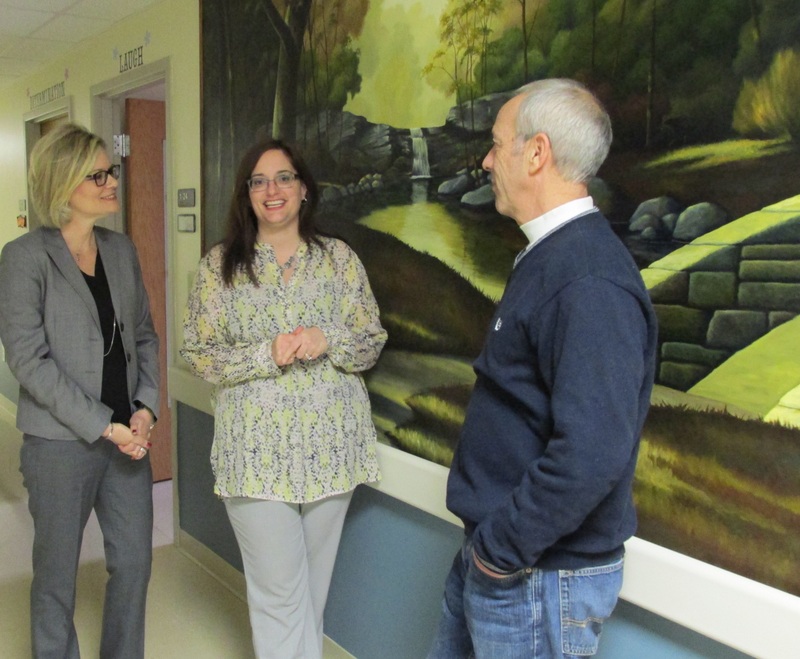 The recent addition of a large wall mural in the unit enhances the care provided to patients in the Behavioral Health unit on a daily basis. Because hospital environments can be somewhat sterile and uninviting, the addition of a colorful, interesting focal point can have a major impact of a patient’s mood and treatment success. Physicians at UPMC Northwest are using new equipment that can aide in the diagnosis of lung disease and lead to earlier, personalized treatment and potentially save lives. 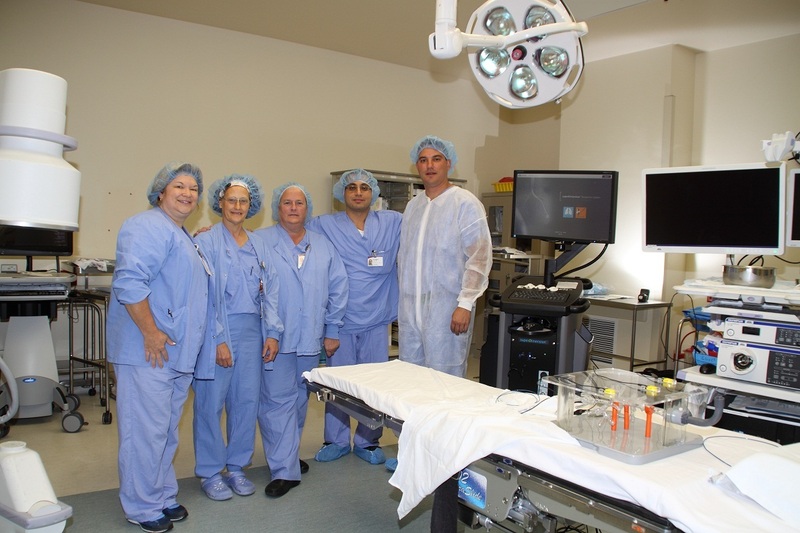 A grant provided by the Northwest Hospital Foundation helped to fund the purchase of the SuperDimension™ Navigation System which enables procedures to be performed that provide a minimally invasive approach to accessing difficult-to-reach areas of the lung. 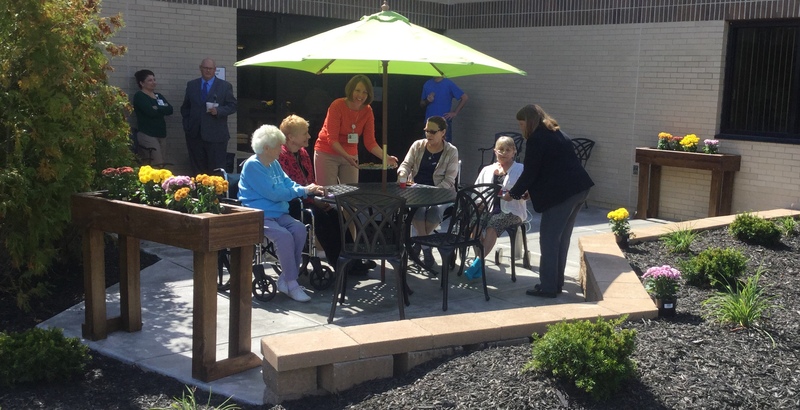 Northwest Hospital Foundation recently celebrated the opening of a new Healing Garden for TCU/Rehab patients as part of National Rehabilitation Awareness Week. The garden is the inspiration of TCU and Rehab staff members at UPMC Northwest who envisioned a recreational area that would provide patients with a private outdoor garden to enjoy during their extended hospitalization in the Transitional Care or Rehabilitation Unit. The garden, funded by the Northwest Hospital Foundation and constructed by King’s Landscaping, includes raised planters for patients to directly participate in the planting, watering and ongoing care of both vegetable and flower gardens. A shaded table and chairs, along with additional seating areas highlight the open-air garden. 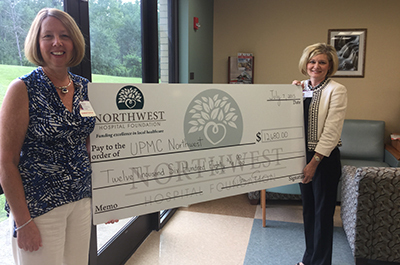 Northwest Hospital Foundation executive director, Theresa Edder (right) presents a check for construction of a Healing Garden at the TCU/Rehab building to Nancy Pastorius, UPMC Northwest VP, extended care/rehab services (left). 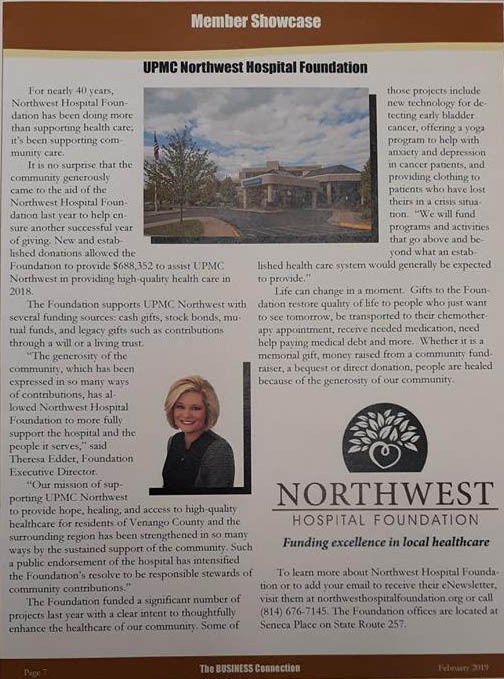 Northwest Hospital Foundation recently approved funding for two projects that directly impact patients and families in the Family Birthing Center and TCU/Rehab units of UPMC Northwest. The projects, totaling nearly $15,000, will provide a new Healing Garden for TCU/Rehab patients; as well as safe sleep instructional books for families of infants born in UPMC Northwest’s Family Birthing Center. The Healing Garden project was developed in collaboration with the TCU/Rehab staff to facilitate an environment that would provide patients with a private outdoor garden to enjoy during their extended hospitalization in the Transitional Care or Rehabilitation Unit.  The garden will provide raised vegetable and flower beds enabling patients to directly participate in the planting, watering and ongoing care of the garden, including harvesting vegetables that can then be used in meals prepared for the patients. 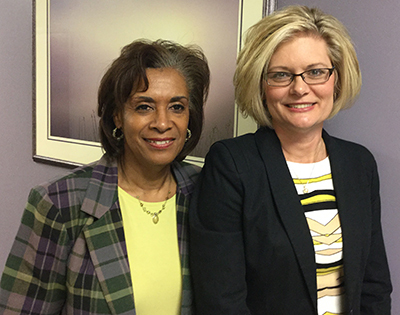 Northwest Hospital Foundation chairperson Denise Jones (left) welcomes the foundation’s new executive director, Theresa Edder (right), during a recent committee meeting. The first several months of 2015 have been eventful for Venango County’s local hospital foundation, most notably with a new identity. 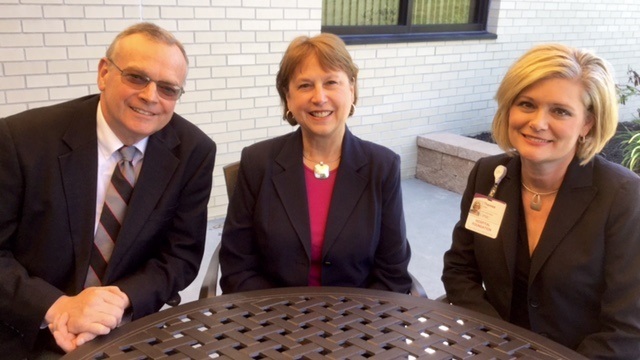 The Northwest Hospital Foundation name was adopted in January, and the changes have kept coming ever since. Denise Jones, longtime Venango County chief clerk/county administrator assumed leadership in January, and along with working on developing a new identity for the local, non-profit organization that exclusively supports UPMC Northwest, the board began a search for a new executive director to replace retiring executive Roger McCauley.